Namita Vikas is the Group President & Global Head, Climate Strategy & Responsible Banking, YES BANK, India’s 5th largest private sector Bank. 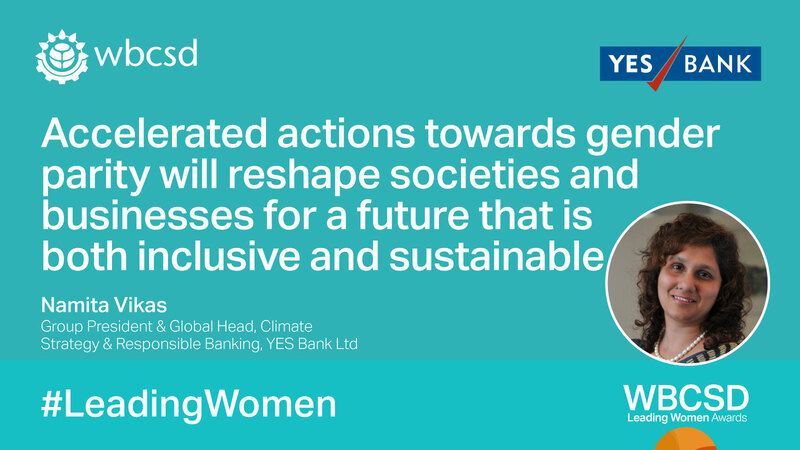 She spearheads Climate Action, Green Financing, Corporate Social Responsibility and Sustainable Development agenda at the Bank. As part of the top management team, she is instrumental in delivering on YES BANK’s vision of being the finest quality large Bank in India by 2020. Under her guidance the Bank has assumed a leadership position in sustainability and green banking, nationally and internationally. Her overall responsibility includes Sustainability Management, driving Bank’s CSR programs, Climate related risks and research, Triple Bottom-line Accounting, building strategies towards Responsible Finance/ Investing and Strategic Philanthropy. Namita serves as a Board Member of “YES FOUNDATION”, YES BANK’s social development arm, and guides its overall strategy. She holds advisory board positions of Asia Venture Philanthropy Network, UNEP-FI Banking Commission, World Resource Institute – India GHG Program and Indian Centre for CSR (ICCSR) and SEED. Committed to sustainable development, she is involved with national and international sustainable policy influencing as a member of United Nations Global Compact, TERI, and is often invited as a global expert on climate finance and CSR to speak at influential platforms. Innovative and a design thinker, Namita with her 27 years of well-rounded experience has been associated with the World Bank, Asian Development Bank, International Finance Corporation and the United Nations to drive the climate finance agenda and towards green financing policies. In the past she has successfully held leadership positions with Marico, Microsoft Corporation and Confederation of Indian Industry (CII).